The Carolina Panthers visit the Chicago Bears in Week 7 of the 2017 NFL season. PFF previews the top player matchups of the game. 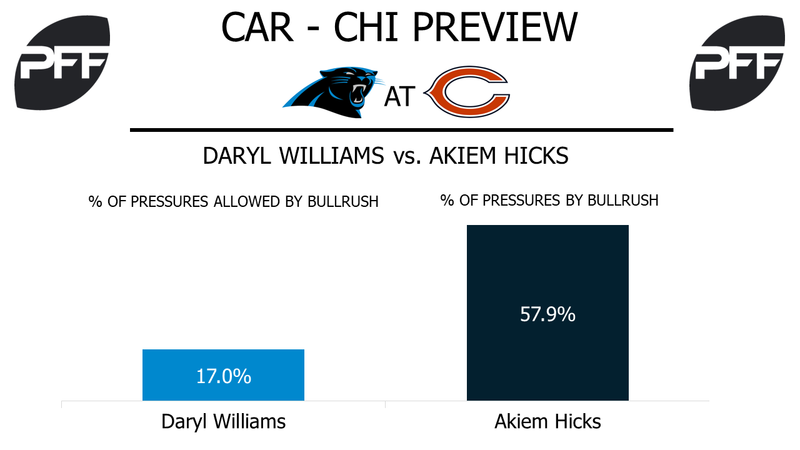 T Daryl Williams vs. DI Akiem Hicks – Williams is coming off one of his worst games of the season as he allowed five total pressures to the Eagles. But he was still the lone bright spot as the team’s highest graded lineman in the game with a 75.7 overall. The Panthers’ offensive line allowed 26 pressures in Week 6, the second-most by any offensive line in a single week this season. Williams is the Panthers’ second-highest graded linemen with a pass-blocking grade with 78.1 and run blocking grade with 80.0 this season. He will face off with Hicks, the only 3-4 defensive end with 15 or more run stops and 15 or more pressures. But Hicks’ most used pass-rush move is the bullrush, which is how he has recorded 11 of his 19 pressures. The bullrush is also the pass-rush move that Williams has blocked the best this season, only allowing 17 percent of his pressures allowed by bullrush. WR Devin Funchess vs. CB Kyle Fuller – Funchess is entering Week 7 playing the highest snap percentage of his career at 78.8 percent. Since Week 3 Funchess is the seventh-most targeted wide receiver, ahead of players like Jordy Nelson, and AJ Green. Meanwhile, Fuller has been targeted 51 times this season, the third-most by a cornerback, but has only allowed one receiving touchdown this year. He is the only cornerback to be targeted over 45 times and only allow one touchdown. In Week 6, Fuller was targeted 15 times and only allowed a passer rating of 42.4. However, his five missed tackles in the passing game are the second-most by any cornerback. TE Ed Dickson vs. LB Danny Trevathan – Dickson was another Panther to have a poor performance against the Eagles in Week 6. He recorded his first two drops of the season and he had a passer rating of 62.5 when being targeted. After Week 6, Dickson’s yards per route run dropped from fourth-highest by a tight end to 10th. It’ll be tough for Dickson to bounce back against Trevathan and the Bears defense. Trevathan has only allowed a passer rating of 64.6 when covering tight ends this season. He’s also only allowed 0.80 yards per coverage snap, which is the 12th lowest by an inside linebacker. T Bobby Massie vs. Edge Julius Peppers – Massie has had an up-and-down 2017 season so far. Through six games, he has a 52.0 overall grade that ranks 45th at his position. In pass protection, he’s allowed two sacks, two hits and 13 hurries over 202 pass-blocking snaps, but he’s had more issues in the ground game with the 16th-lowest run-blocking grade of 40.1. In this matchup, he should regularly face Peppers, who’s having a productive season in his 16th year with a 71.7 overall grade. He’s credited with eight sacks, two hits and six hurries on 118 pass-rushing snaps, and he rushes from the left side of the defense 84.7 percent of the time. WR Tanner Gentry vs. CB James Bradberry – Gentry was promoted back onto the active roster for Week 6 and played the most snaps (76) of any Bears receiver. Officially, he was not targeted in the game, but there were two passes thrown his way on plays that both ended up being nullified by penalties. Gentry faced press coverage on 25 of his 26 routes run in the game. He’ll have his work cut out for him against Bradberry, the Panthers’ highest-graded cornerback this season at 75.9 overall. He’s been targeted 39 times this season and allowed 20 catches for a 51.3-percent completion percentage that ranks in the top 25 at his position. 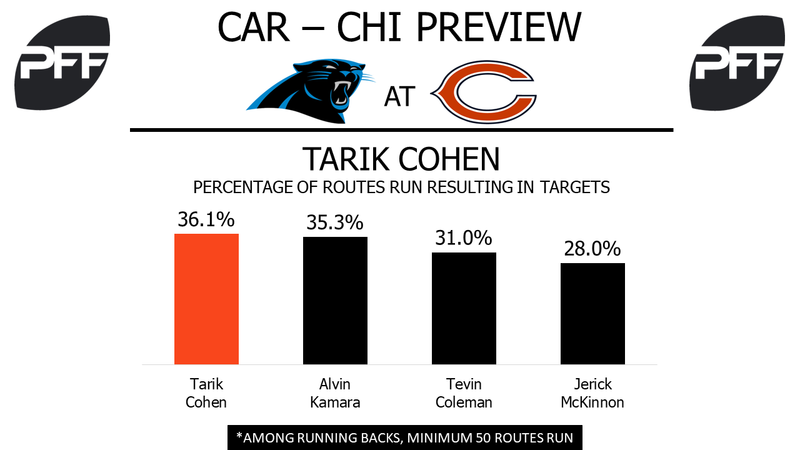 RB Tarik Cohen vs. LB Shaq Thompson – Cohen hasn’t had a run go for more than nine yards in the last three weeks, but he continues to find was to contribute in the passing game, and he has a 75.1 overall grade to show for it. No running back in the NFL has forced more missed tackles after the catch this season than Cohen, and he’s averaging 1.94 yards per route run, the eighth-most at his position. Thompson could have some trouble trying to cover him. The Panthers linebacker has been targeted 19 times in the past three weeks, allowing 16 catches for 185 yards and two touchdowns for a 142.3 passer rating. However, he hasn’t missed a tackle in coverage this season.